Lilit is has over 4 years of experience as an Executive Search Consultant in the Life Sciences industry. Additionally, she has a strong track record in middle management placement in sales and marketing discipline. Today, she helps companies in developing their talent acquisition strategies and therefore has essential tips to give us regarding being successful in the work field. She is also a very good writer and uses this quality to regularly share those tips with us. Here is her latest article about 5 recommendations to make your social media profile stand out. More than 65% of the open jobs in Germany usually are not advertised according to the Institute of Employment Research (IAB). Relying only on the classic way of searching for a job through checking the job postings is not the most effective method. 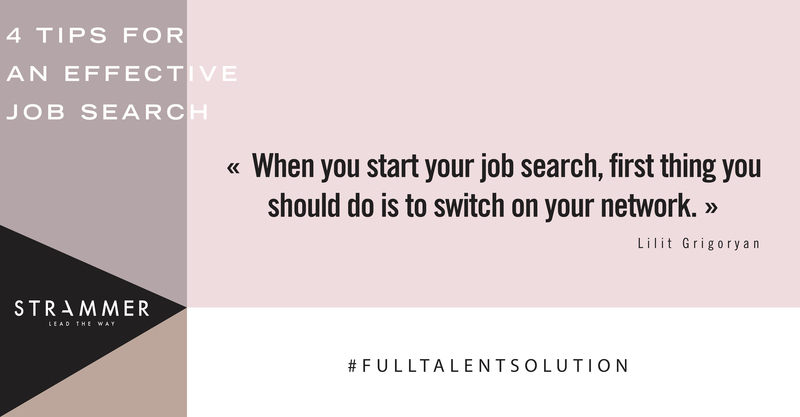 When you start your job search, first thing you should do is to switch on your network. Networking is one of the most effective ways for finding a job. According to LinkedIn 85% of jobs are filled through networking. Make a list of any relevant person (business contacts, friends, family) you know and who could help you to open doors to the job you are looking for. Get in touch with them and openly communicate your matter. Make sure to attend industry related events. Prepare yourself for the event. This will not only help you to create your network but also will give you the opportunity to meet employees from your target employer, who later can act as a referee for your application. Check which companies will attend and check the participant list if possible. During the event make sure to be active, exchange and leave good impression. Make sure after the event to follow-up with the contacts you made. Many companies use recruitment agencies to fill in some positions. Many jobs are never advertised, especially the senior roles. In 2016, more than 60,000 positions were filled in through recruitment companies in Germany. Proactively contact recruiters and build your network there. Chose recruiting agencies who especially have your industry expertise, look at the experience and reputation in the market to get the professional support. If you look for a position in the life sciences industry, I recommend to contact STRAMMER – one of professional and experienced consulting companies in this field. If you want to share your thoughts about the article, click here!